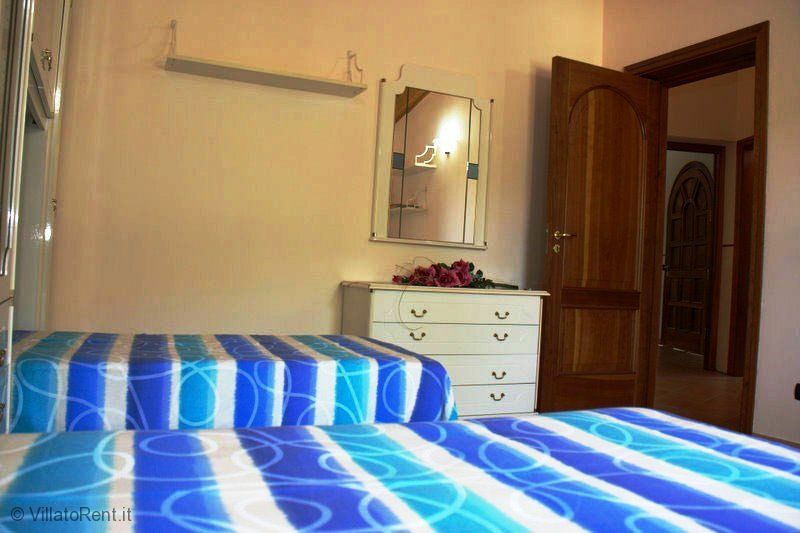 Villa Magnolia is located in Sant'Agnello di Sorrento, in the Colli di Fontanelle village, 6km away from the centre of Sorrento and 9 km from Positano, the nearest beach is 6 km away. This fortunate location named " Belvedere" has a breathtaking view on the Amalfi coast and Li Galli islands and Ocean.This is and "end road" very quiet and safe. 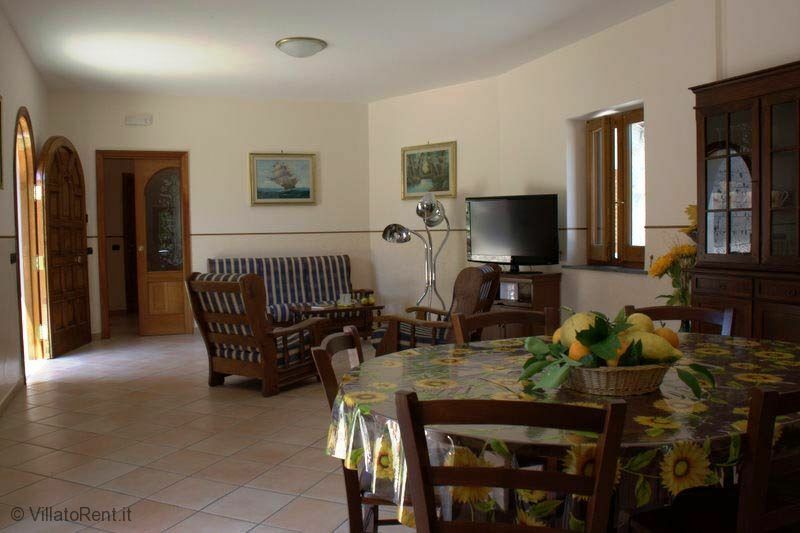 It's a large property that includes a nice swimming pool with partial view on Amalfi coast and a really nice and well kept garden. The Villa it has been recently remodelled. 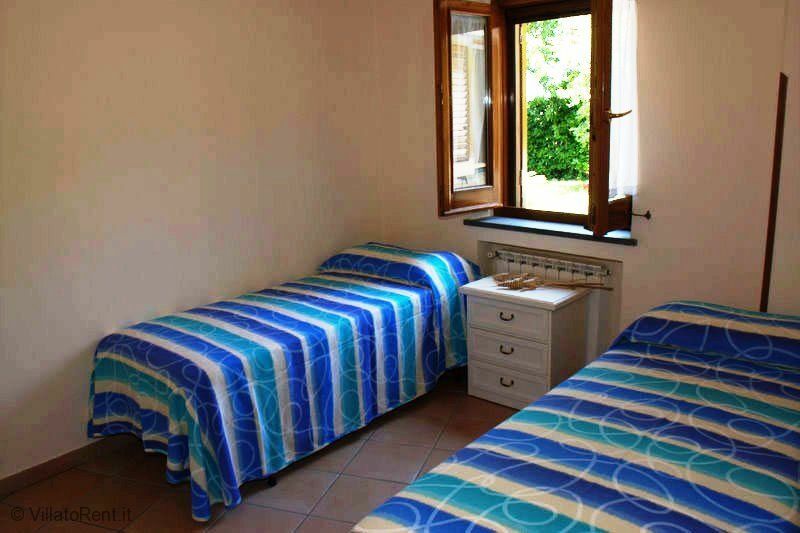 In the villa you'll find a large lounge with full equipped kitchen and a television set, three bedrooms, two bathrooms, one with Jacuzzi and the other with shower box. 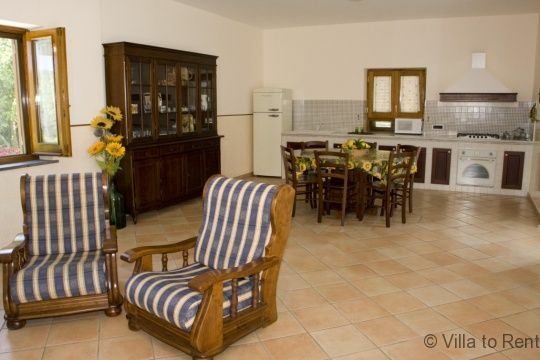 The villa has two big Air conditioner, even its not really needed even in summer time. Inside the villa has 3 bedrooms, ( two double bedrooms and one twin bedroom) and 2 Bathrooms, and an open plan Living/Kitchen. 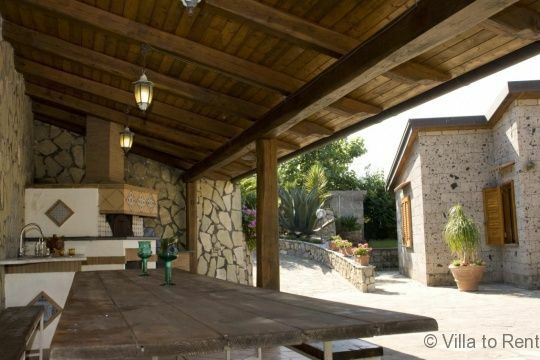 Outside there is a wide courtyard and a porch with a wood-oven for Pizza and BBQ. You can try to make your own Pizza, or ask for a professional "Pizzaiolo" to make it for you! In the garden there is a nice private swimming pool with sunbeds and umbrellas ready for your sunbathing and an annexed outside shower. The pool is available from the middle of may until the middle of September weather permitting. You'll be able to park your car ( up 3 cars) inside the villa lot. 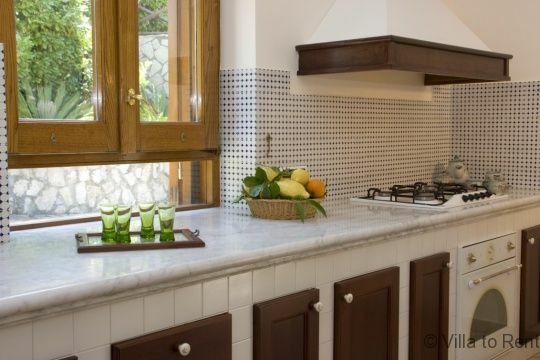 At guests disposal, a cultivated areas where guests may pick seasonal vegetables for a fresh Neapolitan cuisine! 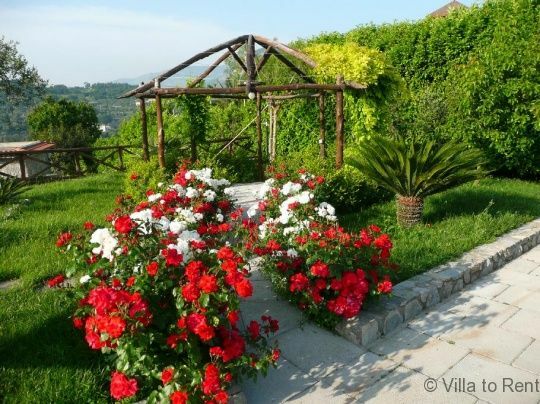 Villa Magnolia is located just 80 mt. 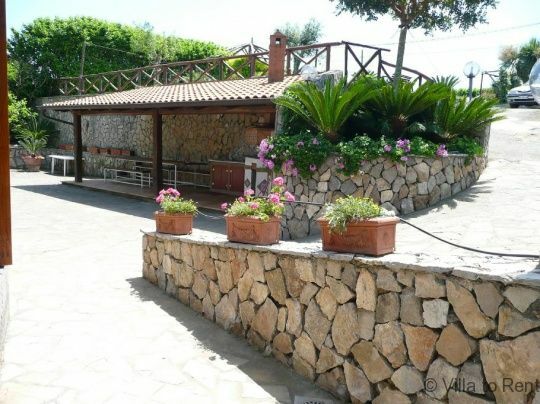 away from Villa Miragalli, so could be rent together to host a large party of 2 families or friends. Das Haus ist schön und vor allem ruhig gelegen, da die Straße eine Sackgasse direkt an der Steilküste ist. Kein Durchgangsverkehr - nichts. Das Meer sieht man zwar aber auch nur von ein zwei Eckchen des wunderschönen Gartens aber der Blick auf die Berge ringsherum ist auch schön. Die Vermieter sind sicher die nettesten Menschen, die uns je als Vermieter im Urlaub uner gekommen sind. Sie haben sich rührend um alles gekümmert und haben uns mit Obst, Gemüse und selbs gemachtem (leckerem) Wein versorgt. Der Pool ist gut und für die Familie groß genus, wenn auch nicht riesig. Der gesamte Außenbereich des Hauses ist gut in Schuss und gepflegt. 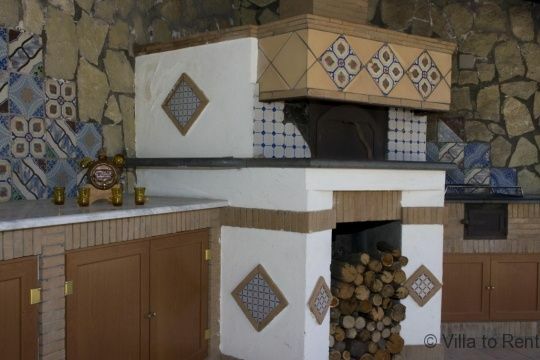 Die Einrichtung der Villa ist eher schlicht. 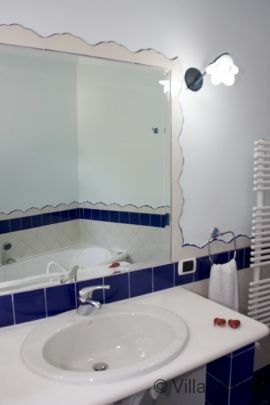 Hier könnte man durchaus etwas in modernere Möbel, Lampen und Co investieren und das Haus nochmal deutlich aufwerten. So ist der Wohnbereich eher schlicht und nicht soo gemütlich. Die Schlafzimmer sind gut und die Betten ebenfalls. Alles ist sauber und gepflegt. Fernseher und WLAN sind ebenfalls state of the art. Wer mehr als 4 deutsche Sender benötigt, hat allerdings ein Problem. Da wir ohnehin 90% unserer Zeit außerhalb des Hauses in Garten, Pavillon und am Pool verbracht haben, führt die Inneneinrichtung für uns aber nicht zu Sternabzug. Trotz derruhigen Lage ist man mit dem Auto in 2 Minuten und zu Fuß in max. 10 Minuten an einem Supermarkt, einer einfachen Eisdiele / Café, drei Restaurants im Ort und mehreren außerhalb (sehr empfehlenswert die Pizzeria Da Salvatore O' Canadese), ca. 2,5 km außerhalb des Ortes und mit toller Pizza / Bruschetta, netter Bedienung und Blick auf Vesuv, Golf und Neapel. Wir hätten es hier problemlos weitere 3 Wochen ausgehalten und würden ebenso wie die Kinder jederzeit wieder kommen, wenn Kampanien wieder einmal unser Ziel sein sollte. Wer das Nachtleben oder Shoppingmöglichkeiten sucht, ist hier total fehl am Platze oder muss halt längere Fahrzeiten nach Sorrent, Positano etc. einplanen. Im Ort selbst bekommt man alles was man zum Leben braucht, aber Handtaschen, Hemden und Spielsachen sollte man anderswo kaufen. Unser Favorit zum Einkaufen und Eis essen auf der Halbinsel war Vico Equense. Nicht überlaufen, nicht hektisch, nette Geschäfte und tolles Eis! Erholung mit Familie: das funktioniert hier optimal! The villa was everything that we hoped it would be; clean, spacious, well equipped and in the most beautiful, quiet, tranquil location. The owners were delightful and brought us several bottles of their delicious wine! They and their agent, Bruno, could not have been more helpful and attentive. I would suggest that anyone staying here plans their week carefully as travel is very expensive and the villa is quite remote. Once we discovered the inexpensive local bus service to Sant Agnello getting around proved a little easier. Pompei, Vesuvius and Herculaneum are all accessible via this service and then train - very easy. Car hire is probably best for exploring the Amalfi coast and this will cost a lot so make the most of the hire period! The mini-market at the top of the hill is fantastic as is the pizzeria 'Stelluccia' where the staff are lovely, the food is excellent and good value. We spent a wonderful week at this villa (June 5-12, 2010). The property itself and the views are spectacular. The owners, Michele and Tina, were excellent hosts and made us feel welcome immediately. We are a family of three generations, including three children (ages, 15, 9 and 2) and found this to be comfortable for all. The pool was a favorite of all of us and the gardens were not only beautiful, but provided room for the children to play as well. Dinner at their new table under the gazebo was a perfect end to the day. 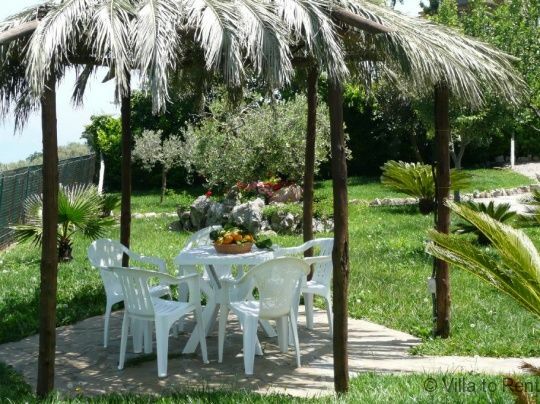 We had arranged through the rental agency to hire a pizzaiolo to come one evening and we were delighted when this turned out to be Michele and Tina who produced wonderful pizzas for us in the villa’s outdoor pizza oven. It was the highlight of our stay! Especially the Nutella dessert pizza! Our hosts were most generous. Although no vegetables were ready at the time of our visit, they shared ripe cherries and lemons from their trees with us. A car is a must if you stay here but you will not regret choosing this villa. We would love to return. Recommended for: Families with teenagers, sightseeing, romantic getaway, age 55+, families with young children, people with disabilities. Maison très agréable avec un jardin magnifique et une vue superbe, idéale pour passer des vacances proches de la plus belle cote du monde sans avoir les inconvénients de la foule bruyante des touristes. Proche de tout et à l'abri des voisins. Piscine avec vue imprenable sur la cote Amalfitaine. Gentillesse extrème des propriétaires qui ont mis à notre disposition les produits du jardin (fruits légumes...) mais aussi leurs contacts et leurs bonnes adresses.